King Drug and Home Care has been serving western Kentucky for 40 years. With nine stores and a related company, Pro-Care Home Health that provides nursing, nutrition, therapy, health aide and other services, it is a major presence in the region. The company sought an innovative way to communicate with customers that went beyond traditional store signage and advertising, which is costly to maintain. They discovered StrandVision Digital Signage and purchased a “Gold Package” that offers shared video and the flexibility that King Drug requires. King Drug and Home Care, a nine-store chain serving western Kentucky, has a lot to say to its customers but wants to be polite and friendly in its approach. "Director of Marketing Ken Croft and I were searching for a way to communicate with customers," commented Richard Mabrey, King Drug Systems Support Specialist. "We thought about an email newsletter and other approaches." Richard also looked into hardware devices that would allow King Drug to insert its commercials into regular cable programming. It was "very, very pricey" and complex, so Richard asked some business system suppliers for suggestions and was introduced to the term "digital signage." He conducted an Internet search on digital signage and found StrandVision. 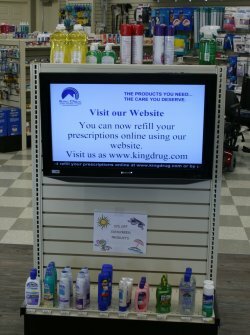 After talking with StrandVision Sales Manager Amy Hansen and seeing an online demo that Amy had customized with information from King Drug's Web site, Richard saw the potential and concluded that StrandVision Digital Signage met all of his needs. Richard and Ken decided to install the first digital sign in a new store being built in Morgantown, about 30 miles from the company's Bowling Green headquarters. The design called for a 26" flat screen to be mounted on an island in the pharmacy waiting area. Richard purchased StrandVision's "Gold Package," which gave them the ability to share up to 15 minutes of video and 200 digital slides among all their screens, and 64MB of storage. Being coordinated with the new construction enabled them to lay conduits in the concrete floor for both electrical and VGA cables. Richard handled the equipment installation himself. The computer driving the screen is about 70' away in a secure area with a VGA converter box located at the display. StrandVision trained both Ken and Richard on how to post and update what Richard calls the "super easy" system. Being half an hour away is not a problem. Ken and Richard simply log onto the StrandVision server over the Internet to add or change slides. They are running a mix of King-sourced commercials and videos, as well as slides. The system automatically blanks out the digital signage slides when the videos are scheduled in the mix. It also turns the audio on at the display unit for the video clips. King Drug is considering producing special videos for the digital signs that welcome customers to the store and cross-sell other King Drug and Pro-Care Home Health products and services. Larger stores and medical complexes will have multiple displays including screens at front checkouts and pharmacy drive-up lanes. They are planning to run most of the same content across their locations, but will have some slides that will play at each specific store. Richard is extremely happy with the StrandVision Digital Signage system, concluding, "StrandVision provides an inexpensive way to do exactly what we were trying to do."